After all of the waiting, Apple has finally unveiled a successor to the MacBook Air – and yes, it comes with a high-resolution display (and a few compromises too). Simply called the MacBook (without an Air or Pro suffix), the new 12.1-inch machine weighs two pounds and measures 13.1mm thick, compared to the 17.3mm of the 11-inch MacBook Air - a difference of 24%. During its unveiling at the company's Apple Watch event, Apple SVP of Global Marketing Phil Schiller described it as the "most efficient notebook ever created". The new MacBook sports a Retina display with a pixel-resolution of 2,304 x 1,440. Its panel measures 0.88mm thick, making it the thinnest display built into a Mac and one that consumes 30% less energy than previous models, according to Apple. It's also the first fanless MacBook and operates "silently" thanks to housing Intel's Core M Broadwell CPU. The new MacBook has a redesigned full-size keyboard that's 34% thinner than previous models with a 17% larger key cap. There's also a new backlight that lights up each individual key. The new MacBook has a logic board that's 67% smaller than previous models. Describing how Apple achieved that in a video presentation, Apple SVP of Design Jony Ive said that the company took an "extreme approach". He said: "To maximise performance, we took an extreme approach. Components were optimised to fit together and create the highest density logic board yet, which is two thirds smaller than what had gone before. "A fundamental goal was eliminating the need for vents or moving parts, allowing it to operating in silence. By consolidating the antenna within the bottom case we were able to design an integrated aluminium hinge. 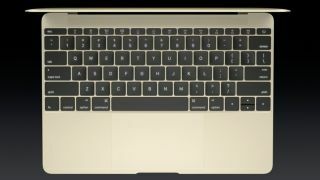 This innovation with a unibody enclosure makes it the fist all-metal MacBook." As expected, the machine uses the new USB type-C connector, which takes a cable a third the size of a standard USB cable, for connecting and charging devices. The cable is reversible and provides power, HDMI, USB, DisplayPort and VGA in one connection. Apple has created the MacBook's battery in layered sheets that fit the contours of its enclosure, allowing for 35% more capacity in the same amount of space and provides nine hours of wireless web use. The trackpad, which apple calls the Force Touch Trackpad, uses Force sensors and employs what apple calls a Taptic Engine to provide feedback when clicking, and the level of feedback can be adjusted using software. It will start at $1,299 (£1,049 in the UK) for the base model that comes with a 1.1GHz Intel Core M CPU, Intel HD Graphics 5300, 8GB of memory and a 256GB SSD. It will be joined by a $1,599 (£1,249) version that comes with a 1.2GHz dual-core Intel Core M CPU, Intel HD Graphics 5300, 8GB of RAM and a 512GB SSD. Both will be available in silver, space grey and gold from April 10. Apple launched the MacBook Air in 2008. It has been one of the company's last devices to get a Retina display after the iPhone, iPod touch, iPad, MacBook Pro with Retina and iMac. What else is going on at the Apple Watch launch event?